Fall is my favorite season. I love everything about the fall from the fashion (throwing on a cozy sweater when the air get crisp), to the food (hello cider donuts, apple pies, and pumpkin spice lattes), to football Sundays (go Pats! ), and the beginning of the holiday season. However, with that being said, I am nowhere near ready for fall to arrive. I feel like summer just began for us living in New England, and I'm going to try to hold onto it as long as I can. Therefor, you'll still see plenty of summery outfits here on the blog, but as I previously mentioned, I 'm working on my updating my fall wardrobe, so also expect to see a mixing of fall items in with my summer looks. In addition, I started cleaning out my closet, and came across this leopard print blouse. Because it's slightly sheer and lightweight, it's great for layering, and perfect to wear when the temperature begins to drop. I paired it with my white shorts and lace up sandals for a 'cool' summer look. On a separate note, have you guys tried Depop? When I sell clothes, I usually use Ebay, but have heard good things about Depop so I just signed up. Since I'll be doing a major closet clean out in the next month I'll be adding a lot of clothes. I have a ton of Joie blouses and Parker dresses that I still love, but unfortunately are a little too short for my thirty year old body, so I will be selling them. I already have a stack of designer denim that I'll be adding soon. So make sure to check out my account @rachaelthomas. 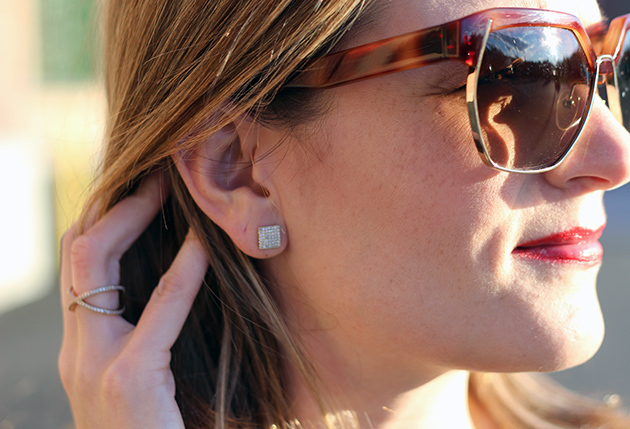 I'm still loving my Rocksbox jewelry and wear these earrings everyday! I love them so much I'll probably end up buying them, but also can't wait to see what's in next month's box. If you haven't tried Rocksbox yet, I highly suggest it. You can get your first month free by using my code: thomasrachaelxoxo at checkout, so you have nothing to lose, especially because you can cancel anytime. But if you're a jewelry lover like I am, you'll love this service! You can read more about Rocksbox here. I wish everyone has a wonderful weekend! Mike, the boys, and I are taking a mini vacation and heading up to the lake for a long weekend. I'm excited to get away, soak up some sun, and perhaps finally get a tan on my legs??? Ha! You can follow along on Snapchat (Rach480) and Instagram (@thomasrachael). Thank you for stopping by. That leopard works so well with the shorts! And those sandals-I so wish I would have picked those up when they had my size! Have a great vacay! Cute top! Do you wear a cami under it? I have a leopard top too from Express and I didn't realize I could tie it up like that! Adorbs! Thank you Virginia! I'm not wearing a cami in these photos, but I do often wear one with this blouse. I love leopard! I have a leopard skirt I wear all the time, but I don't have a blouse. I like this look! I've never heard of or used Depop. LOVE the sandals! I can't believe they are Old Navy! I'm also loving your rocksbox pieces! i own a similar chiffon leop blouse. I have to try it with some of my khaki shorts. You look great, Rachel. Enjoy the weekend! I love your casual chic look here... and such a lovely day! Love the blouse WOW :) Kiss kiss from France,Sand. So cute! I don't think you can go wrong with leopard print and I love it with the white shorts! I adore that shirt (obviously!) and love how you've paired it with white shorts for summer!! I love fall too, but I'm with ya on not wishing away the summer quite yet! It definitely goes by way too quickly here in New England! Great outfit! You can never go wrong with leopard! Love the leopard top with the shorts and totally loving those sandals!